Bill is an authorized Martin warranty repairman. Much of his shop time is taken up with making guitars fun to play again. He also works on other acoustic guitars. 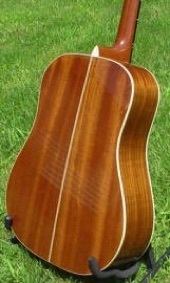 Vintage Acoustic is our brand name for the guitars and resophonic guitars Bill builds. He is currently playing a "Norman Blake" design guitar. It has brazilian rosewood sides and back, is joined to the body at the 12th fret and has a thinner body than a dreadnought. 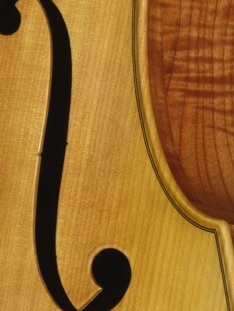 The top is made of Carpathian spruce. It is pictured below with the resophonic guitar Maggie has been playing for more than 15 years now. Bill also made it. 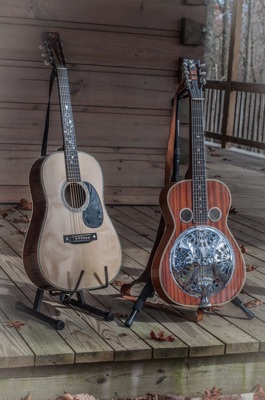 It's body is made of solid sapele with a quarterman cone giving it a more mellow tone The body is thicker than a regular "Dobro". Bill has made more than 80 guitars which are being played all over the US. Below are pictures of some of his work showing a variety of shapes, sizes and materials. Bill also works on basses and builds them. His favorite instrument to play is the bass. He occasionally restores older basses and has them for sale. Below are some pictures of a bass he built.